For a show set in New York City in the late ’90s and early 2000s, it’s odd how little Friends ever touched on the events of September 11. In fact, the show never once commented on the tragic occasion, with the closest mention coming from an “FDNY” shirt Joey wore in later seasons. And yet recently, Friends fans uncovered a deleted subplot from an eighth season episode that actually dealt with airport security that was cut from a post-9/11 episode. Of course, it had nothing to do with the then-recently upgraded TSA practices; it just happened to be a bomb joke in an airport. 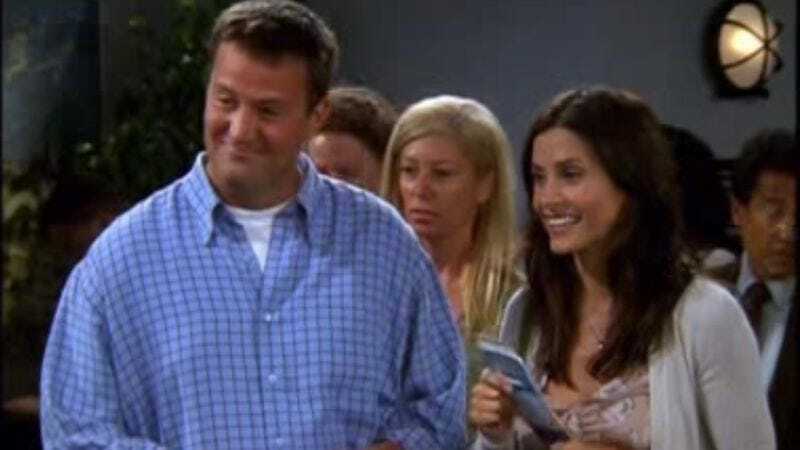 In the scene, Monica and Chandler are newly married and heading off on a trip. While in the airport, Chandler notices the “don’t make jokes about bombs” sign and immediately makes a joke about having a bomb (Oh, that Chandler!). He and Monica are then detained by airport security and it’s basically the whole thing that was done much better in Meet The Parents (a sentence rarely typed). It was going to air on October 11, 2001 and instead was scrapped for another subplot in which Monica is jealous of another newlywed couple. And while it seems ridiculous now, it was probably the right thing to do at the time as, while the scene was no doubt shot many months before the September 11 attacks, tensions were still high and people were still sensitive about such topics.